Applicants, if you do not have an account, click the red box on the right that says "Apply Now." Founded in 1975, Leadership Dallas is the DRC’s flagship leadership development program, aimed at providing our city with an ongoing source of diverse leaders who are prepared and committed to serve as catalysts and sustainers of positive change for the quality of life in the Dallas Region. Learn more on the Leadership Dallas webpage. Thank you for your interest in Leadership Dallas! Every day, we are more amazed and excited to know how many people across the region are working to make an even better Dallas! 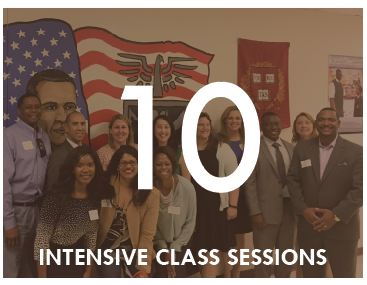 More than 40 classes of Leadership Dallas have embarked on an unforgettable journey together, but each year the first step is to apply. We can't wait to learn all about you and wish you the best on your application. If you haven't had a chance to read through the Dallas Regional Chamber Leadership Dallas Application webpages, you might want to take a look at "Applying to Leadership Dallas" and "Application FAQs." It is encouraged that you do so before applying. Still want to know more? Attend an Information Session to hear from Alumni about their experience and how to make your application stand out. Space is limited! To register, please visit www.DallasChamber.org/events. If you are ready to apply, please click the button below! We strongly recommend using the latest version of Chrome, Firefox or Internet Explorer 11 to complete this application.